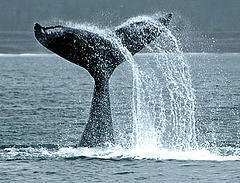 Stay overnight at the remote Kenai Fjords Wilderness Lodge located on Fox Island in the heart of Resurrection Bay. This all inclusive adventure begins with a cruise to Fox Island, a delicious salmon bake lunch, your own private cabin, dinner prepared by our private chef, a hot breakfast to start the day and a cruise on our Resurrection Bay Tour to see glaciers and wildlife. During your overnight stay on Fox Island you may book an optional guided sea kayaking tour, practice your rock skipping skills, search the beach for treasures or just kick back and relax. All Inclusive tour with 3 different cruise options. 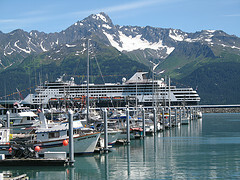 The premium full-day Kenai Fjords Cruise covers magnificent Northwestern Fjord - the home to three amazing tidewater glacier, hanging alpine glacier, abundant wildlife such as Orca Whales, Steller Sea Lions, playful Sea Otters, Bald Eagles, Puffins and of course the magnificent scenery. 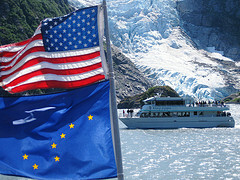 On this tour we travel futher into Kenai Fjords National Park than most other daily cruise tour operators. In addition we visit the Alaska Maritime National Wildlife Refuge and Chiswell Island's seabird rookeries within Resurrection Bay. 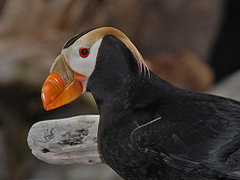 Make sure you bring your camera to photograph the abundant marine and coastal wildlife, many types of sea birds and the untouched beauty of Alaska's shorelines. Tour includes a light breakfast and hot lunch. Total 150 miles round trip. Imagine running a team of Huskies on snow in the summer... Combine three thrilling activities: Helicopter Flightseeing, Glacier Landing and Dog Mushing - everything with breathtaking views of Resurrection Bay and the surrounding glacier-carved mountain ranges. Over 80 Alaskan Huskies wait to share an essential part of Alaska's culture - dog mushing. An experienced guide will explain how to run a dog team, then you're off across a snow field and the lure of the trail and thrill of driving a dog team will create the ultimate experience of a lifetime. Rain gear and waterproof equipment available. 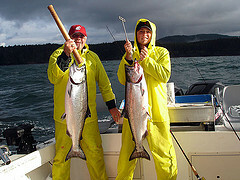 Ever dreamed about trophy Halibut and Salmon Fishing ? Our charter boats in Seward are state-of-the-art - specifically designed for saltwater fishing in Alaska and equipped with the finest fishing gear available such as Penn two speed reels and tackles from Mustad and Berkley. Your guides are dedicated sport fishing enthusiats and they know where the fish is. We offer a variety of charters (max 6 people per boat) for 10-15 lbs Silver Salmon from June - September, King Salmon up to 120 lbs from May - June, Halibut up to 600 Lbs year around.